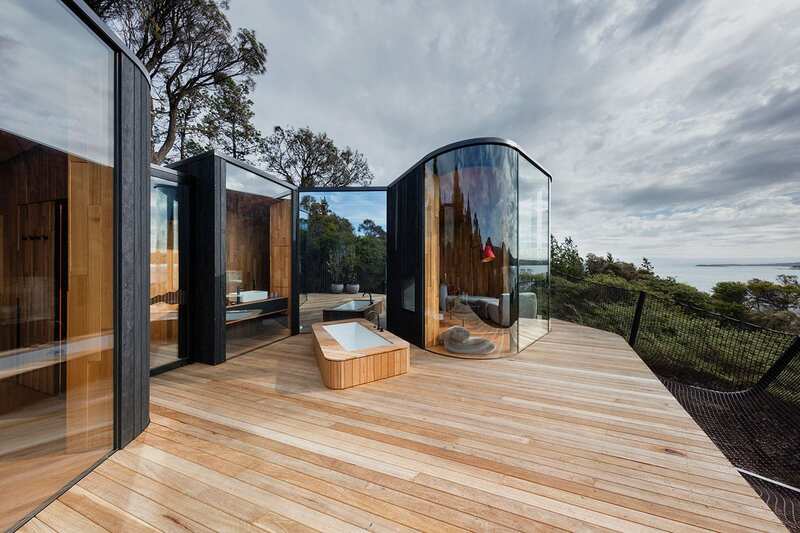 Freycinet Lodge Coastal Pavilions in Tasmania by Liminal Studio. 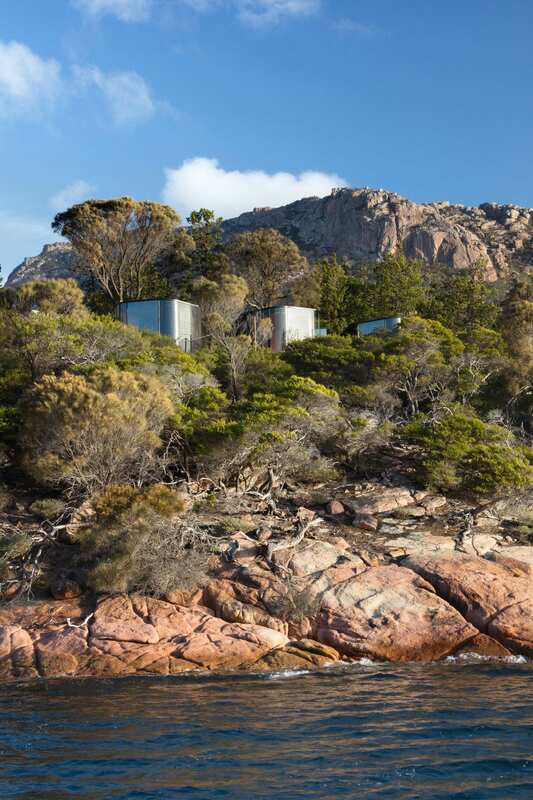 Designed by Hobart-based Liminal Studio, these nine Coastal Pavilions are the newest accommodation offering at Freycinet Lodge. 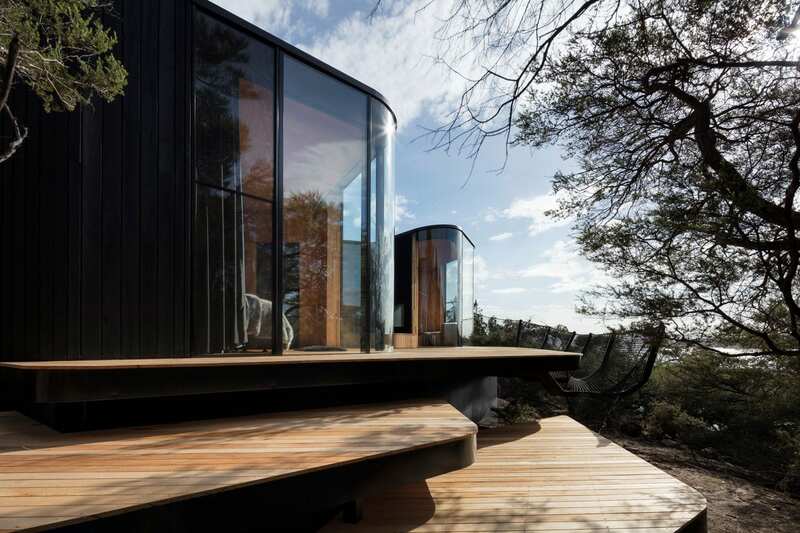 Located at the foothills of the striking Hazards Mountains in one of Tasmania’s oldest National Parks, the pavilions celebrate the breathtaking beauty of Tasmania’s east coast. 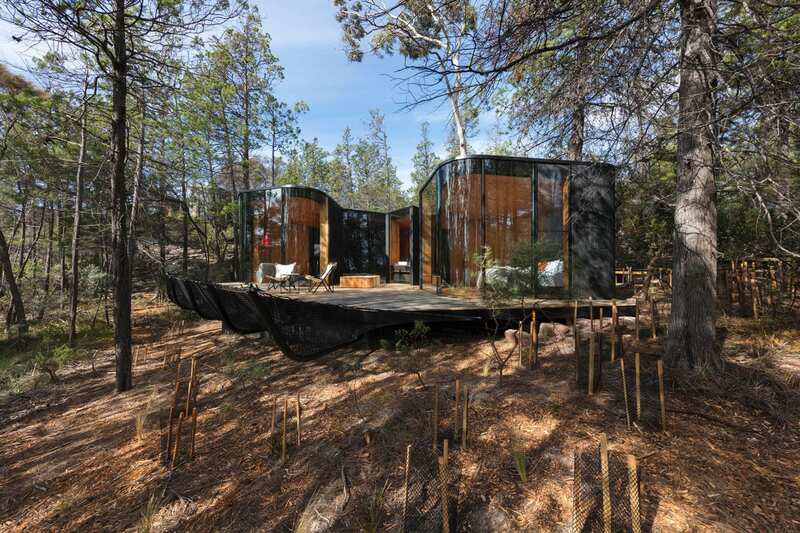 Liminal have been quite clever in their approach to imbue the space with place-specific design responses. 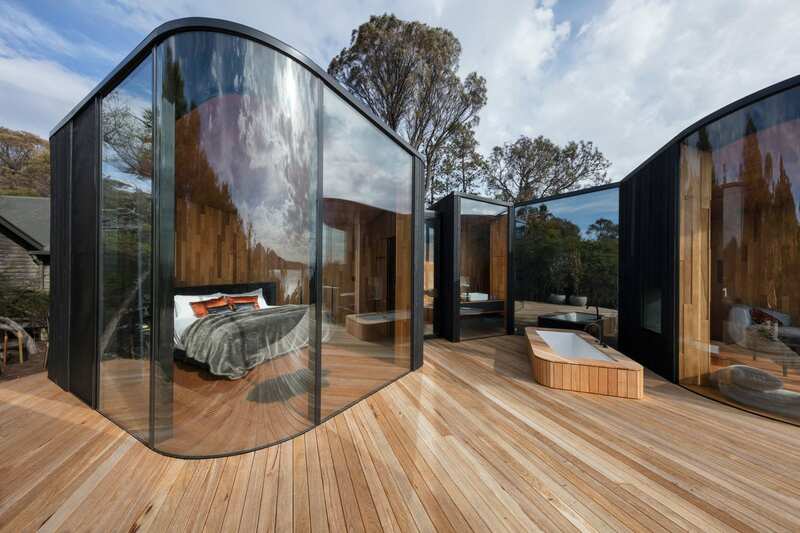 For example, floor-to-ceiling curved windows emphasise the experience of being immersed in nature. 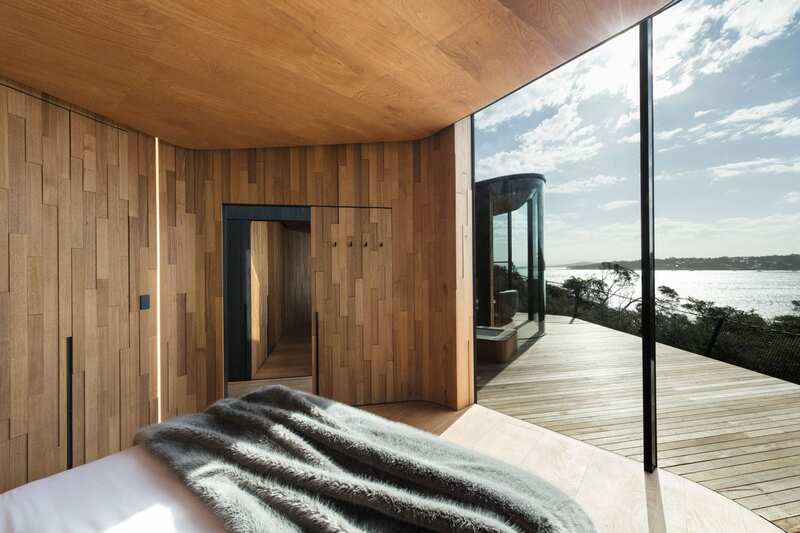 The positioning of the living and bedrooms wing form an embrace reminiscent of nearby bays, protecting the deck and providing privacy for the outdoor bath. 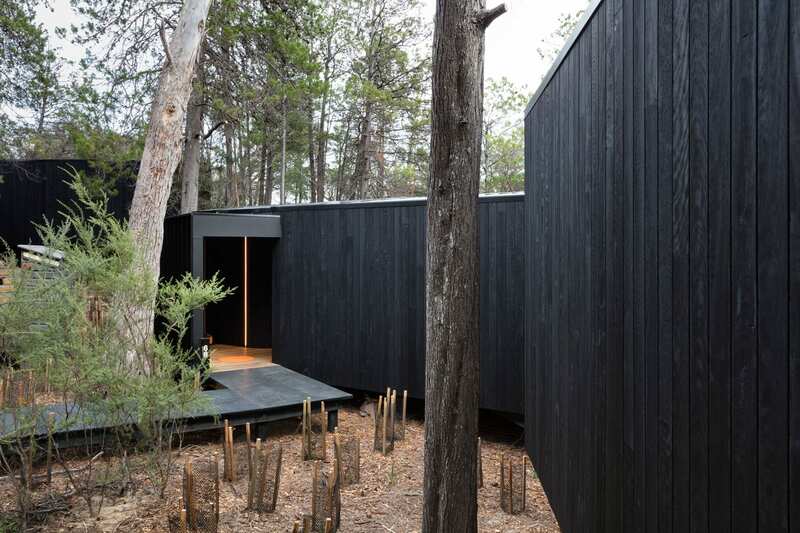 The significance of fire in the bush was also a driving theme, where for instance the black exterior shell is made of charred Red Ironbark. 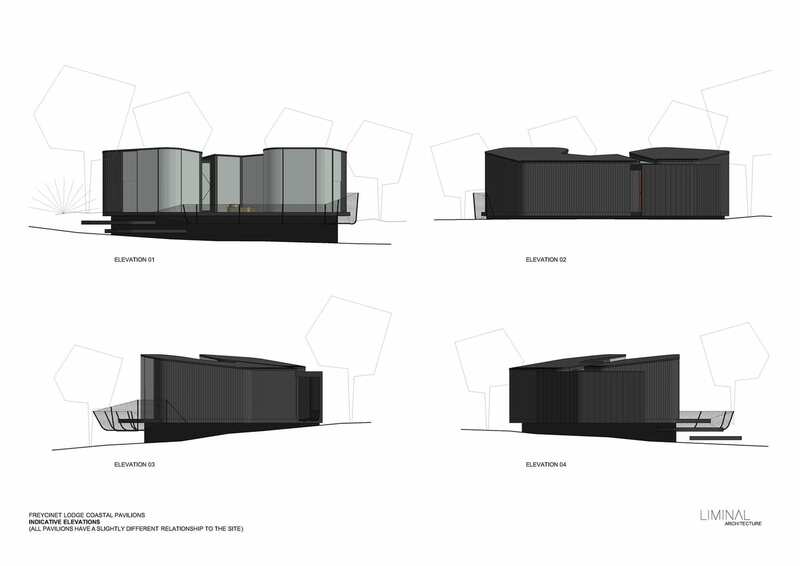 The materials were also selected for the function as well as their conceptual form, where the exterior finish increases the longevity of the specified timber and allows each of the pavilions to be visually discreet. 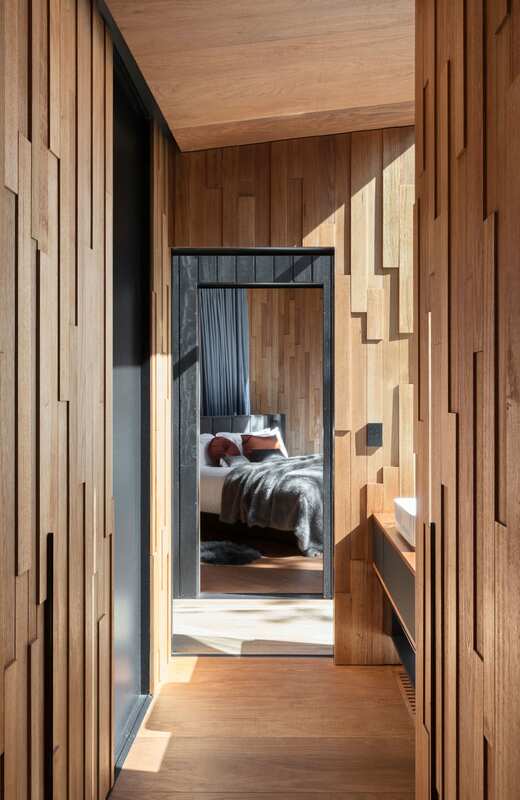 Timber plays a huge role in the project and it’s not difficult to see why. 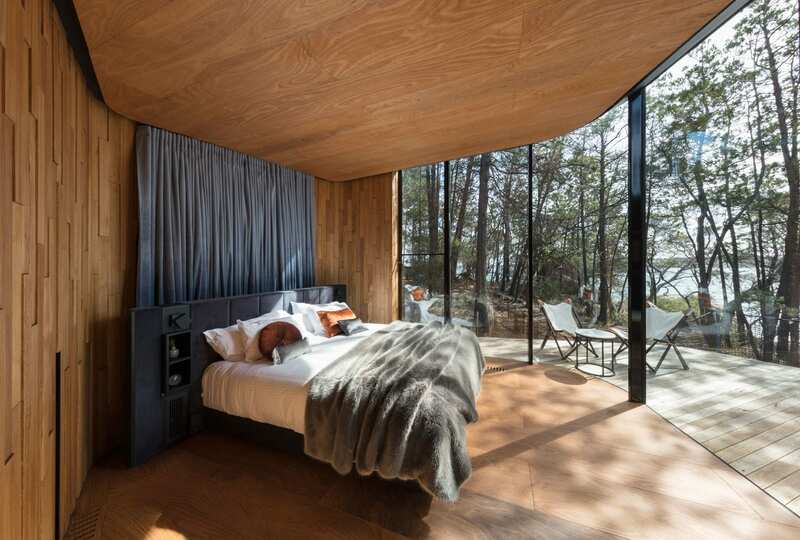 Offcuts of Oak, Blackwood and the only plywood to be manufactured locally, wrap the interiors to emphasise an entirely Tasmanian experience based on the local natural environment. 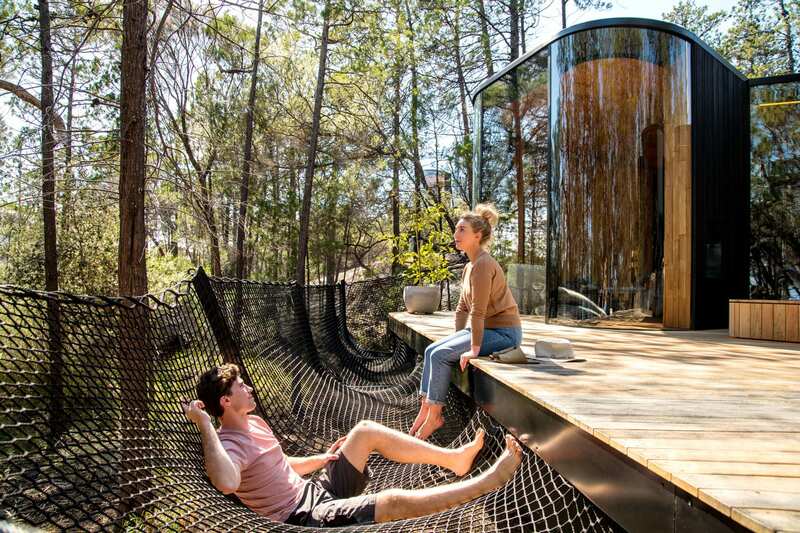 Using robust and organic materials in innovative ways, Liminal Studio has created a unique atmosphere befitting this particular setting. 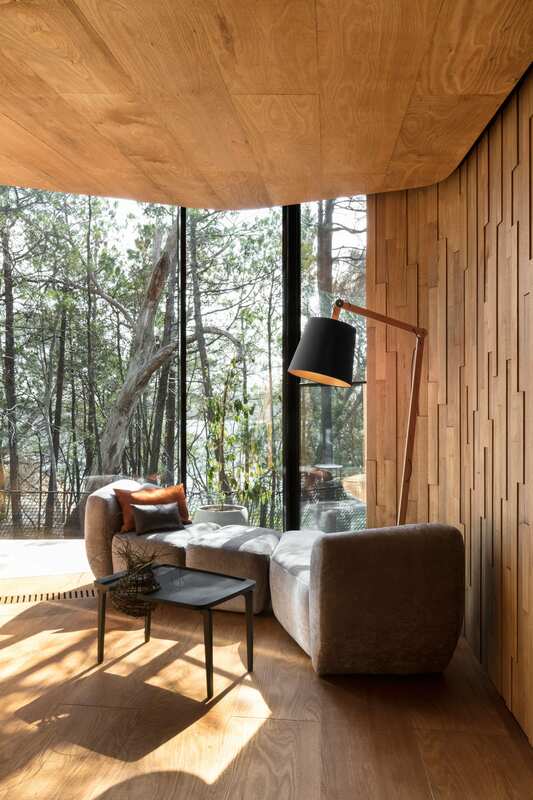 The simple colour palette that guided the choice of interior textiles responds to the coastal textures and colours found in the nearby granite rocks, rich coloured lichen and deep blue ocean, adding a splash of authenticity to the interiors. The project however, wasn’t without its challenges. The absence of right angles combined with complex curved forms meant that the builders’ skills were put to the test, and here, a creative approach to problem-solving from both the designers and their builder meant they were able to produce such unexpected and intelligent design devices. 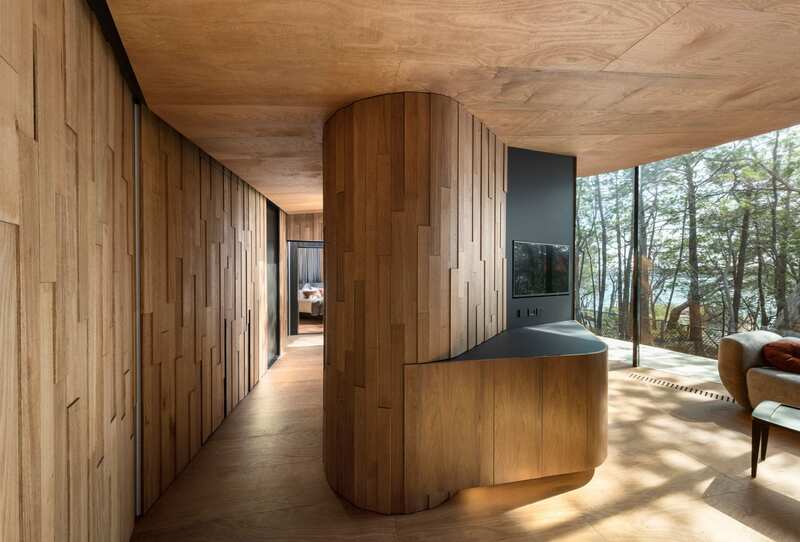 By achieving the meticulous levels of detailing required, Coastal Pavilions reminds us of the true value of craftsmanship in parallel with place-driven design. A complex endeavour, but certainly one worth pursuing. 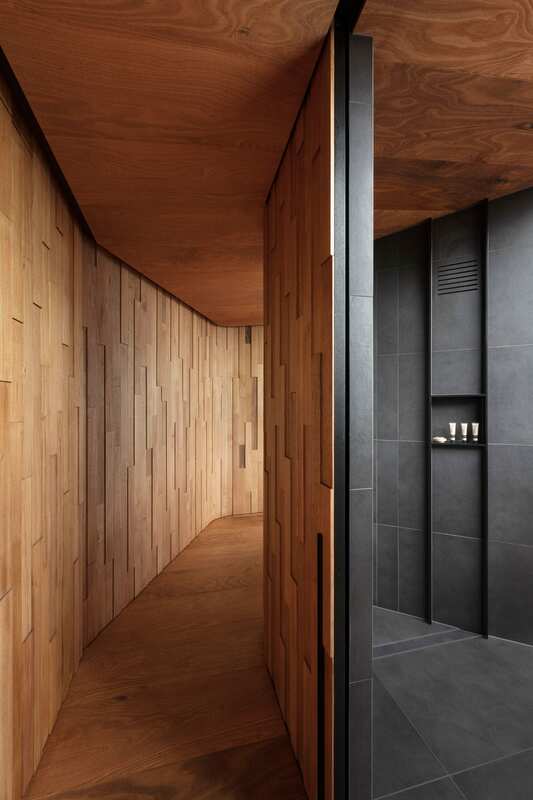 El Camarin: Small Apartment in Buenos Aires, Argentina by IR arquitectura.